Located in the beautiful vineyards behind Moraira, Santa Miguel is the rarest of properties, a stone finca (farm house). it captures all the romance and atmosphere of its 300 years. 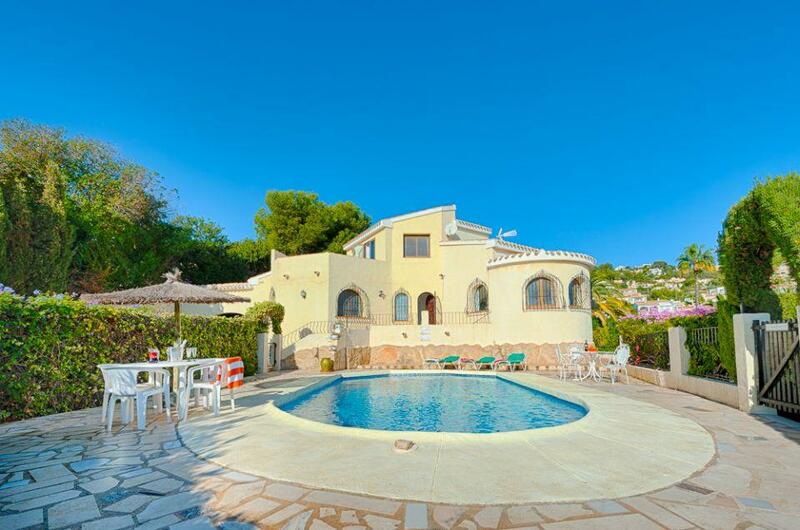 Classically Spanish with all modern amenities including air con, wi-fi and UK Freesat channels. Huge grounds surrounded by vineyards mean you can witness modern farming life too. Recommended. Santa Miguel is a genuine 300-year-old finca (farmhouse) which, although containing all amenities and some modern features, has not lost it´s character in any way. It boasts a history and style that is typically Spanish in beautiful surroundings. It stands in extensive grounds, which are planted with fruit and carob trees. The gardens are fenced-in and with pathways leading onto local vineyards, terraces and parking area. The property offers perfect peace with stunning views and is not overlooked by other houses. The many notable features include a superb terrace with artificial grass surrounding the pool, stunning original tile floors, air conditioning, WiFi, UK Freesat television and a brick-built barbecue area. Less than ten minutes’ drive from the centre of Moraira and Teulada, you have the choice of many local restaurants. The many notable features include a superb terrace with artificial grass surrounding the pool, a modern kitchen, air conditioning throughout, WiFi, UK Freesat television and a brick built barbecue area. 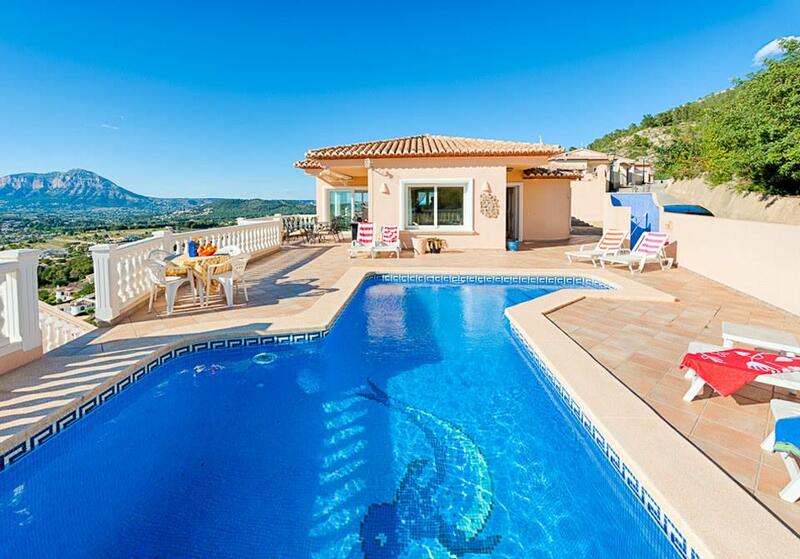 Less than ten minutes drive from the centre of Moraira, nearby restaurants are within walking distance and the countryside views from the upper terrace are stunning. This impressive property is in an excellent location on the outskirts of Teulada, a short drive from Moraira village and offering superb views of the countryside. The entrance is via wide electric ornamental gates from the road onto a sweeping drive and leading up to a large off-street parking area large enough for several vehicles. The entrance to the villa leads into a spacious open living area, with large windows overlooking the pool and terraces and rattan dining set, plus a foosball table. You enter an inside cooler traditional lounge/dining area, via a pair of antique panelled doors, fitted with a flat-screen TV & DVD and to the left to a separate kitchen featuring a range of fitted cabinets, granite worktops, electric oven, ceramic hob, dishwasher and fridge-freezer. This floor also has a full family bathroom. A staircase leads off from inner living room to the upper floor with 4 bedrooms, one double with en-suite bathroom, another double, one with twin singles and another with one single bed. There is also a sitting/dining room at the end of the hall featuring a beautiful Spanish antique sideboard, an additional extra for those wanting a quiet retreat. This then leads onto a large roof-top terrace with stairs down to the gardens and pool area. There is also a family bathroom on this floor. The larger than average swimming pool is 10m x 5m with Roman steps to the shallow end and spacious surrounding terraces clad with artificial grass. The adjoining BBQ area features a built-in charcoal BBQ and conveniently adjoins the kitchen. Please Note: Please read the above description carefully with regard to the layout of bedrooms and beds provided, as in some cases it is necessary to hire an additional folding bed, linen and towels to achieve the full capacity stated. Our folding beds are normally suitable for a child up to 16 years of age. When you make your booking, if you need the extra bed(s), please choose it from the list of extras available in the booking process. 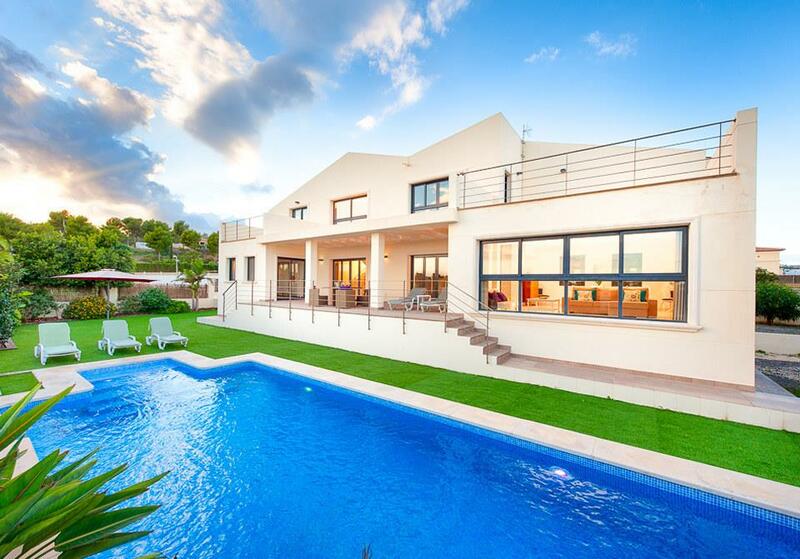 Lovely villa. It was in the countryside but we had cars so it was ok. About a 10 minute drive to the beach. No neighbours which was good for the locals as we are a bit noisy! It isn't particularly modern but it didn't matter to us and we liked the fact it was very Spanish looking. It had all the facilities needed. Pool was great .We would stay there again. A great holiday.